According to data from the North Carolina State Board of Elections and Ethics Enforcement released on October 29, 1,099,555 voters have cast ballots at Early Voting sites since the start of this year’s 18-day Early Voting period. Due to this year’s 18-day cycle, voters have 6 more days to cast ballots at Early Voting sites, and the final days generally see the most traffic. This year, only 34 counties had Early Voting sites open on the second Saturday of Early Voting, compared to 75 counties in 2016, and 100 counties in 2014 (since the 2014 cycle was shortened, the second Saturday was the final Saturday of Early Voting in 2014. On the second Sunday of Early Voting, 20 counties had sites open, compared to 17 in 2016. 2014 only had one Sunday due to the Early Voting period, during which 10 counties had open sites. As stated in Democracy NC analyses for the first day, first weekend, and first week of Early Voting, there is no perfect election to use for comparison. 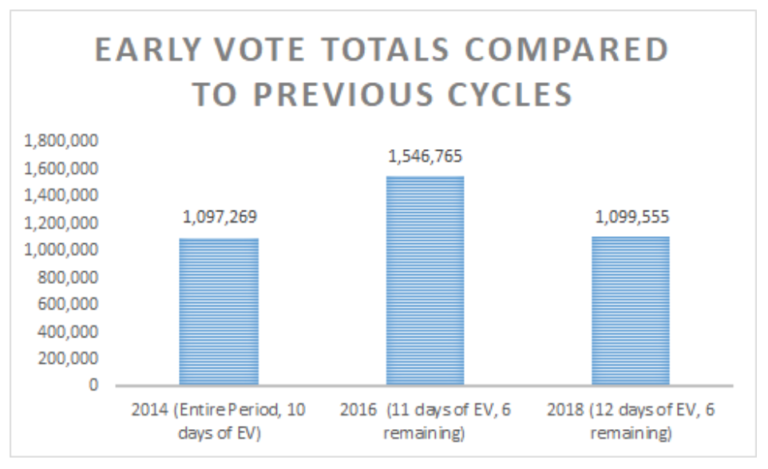 The chart below compares totals for this year’s Early Vote (12 days completed), the entire 2014 Early Voting period (10 days completed), and the 2016 elections (11 days completed). This year’s period began one day earlier than the 2014 and 2016 windows. Across the entire Early Voting period in 2014, which was only a 10-day period, 1,097,269 ballots were cast at early voting sites. Yesterday, 2018 voters surpassed the total of the number of ballots cast during the entire 2014 EV period. Much of the turnout growth is due to white voters, but there are also significant increases in turnout among smaller demographic groups, like Asian voters and youth. At this point in 2016’s 17-day cycle, 1,546,765 ballots had been cast. Following reports of spikes in registration among the youngest voters this summer, voters under 26 have cast 36% more ballots (50,455) at Early Voting sites so far this cycle than during the entire 2014 Early Voting period (37,222). In 2014, voters under 26 accounted for 3.4% of the ballots cast. So far this year, voters under 26 have cast 4.6% of all ballots at Early Voting sites. Across the state, 3.4% more white voters (802,916) have cast ballots at Early Voting locations than during the entire 2014 Early Voting period (776,581), with 6 more days to go. White voters under 26 have cast 40% more ballots so far (31,820) than during the entire Early Voting period in 2014 (22,781). Headed into the final week, Black voters have cast 81% of the ballots (228,157) cast by Black voters during the 2014 Early Voting cycle (283,264), while the number of registered Black voters has grown 4% since 2014. So far, Black voters under 26 have cast 88% of the ballots (9,743) cast by Black voters under 26 in 2014 (11,052). The number of Asian voters who have cast ballots during Early Voting in 2018 (10,792) is now twice the number cast during the entire Early Voting period in 2014 (5,268), with 6 days remaining. The number of registered Asian voters has increased 42% since 2014. Asian voters under 26 have cast triple the number of ballots so far in 2018 (1,315) compared to the entire 2014 Early Voting period (401). So far in 2018, 5,026 Native American voters have cast ballots, a 25% increase from the entire 2014 cycle, which soundly surpasses the 8% growth in voter registration in that time. Native American voters under 26 are up 35% (258) compared to the entire EV period in 2014 (191). 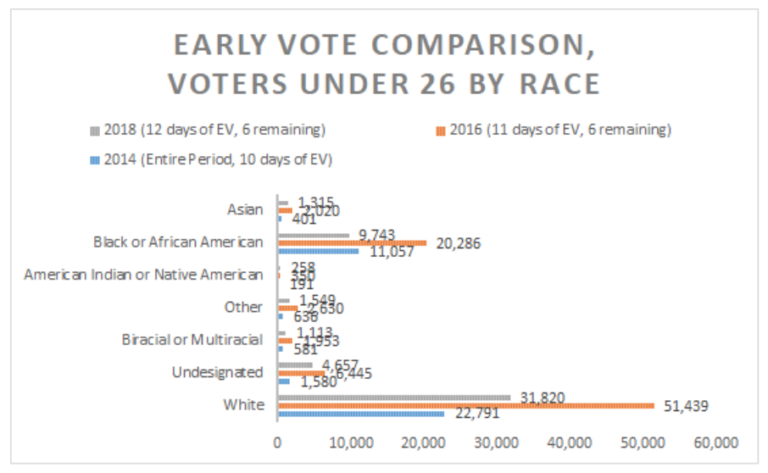 54% more Biracial and Multiracial voters have cast ballots at Early Voting locations (4,795) so far than during the entire 2014 Early Voting period (3106). The number of registered Biracial and Multiracial voters has increased 22% since 2014. Biracial and Multiracial voters under 26 are up 92% (1,113) compared to the entire 2014 Early Voting period (581), and make up 23% of 2018 Biracial and Multiracial voters. The Early Voting data currently available from the State Board of Elections does not include ethnicity information, which precludes a similar analysis for Hispanic or Latino voters. Democrat and Republican numbers are approaching 2014 Early Vote totals, while Unaffiliated voters’ numbers are 31% up. Democratic voters have cast 472,019 ballots so far, which is 89% of the total from the 2014 Early Voting period, 531,503. Democrats can be expected to overtake their 2014 Early Voting total in the next day or two.The number of registered Democratic voters in North Carolina has decreased 3% since 2014. Republican voters have cast 332,527 ballots so far, which is 97% of the total from the 2014 Early Voting period (341,499). Republicans will likely overtake their 2014 Early Voting total today. The number of registered Republican voters in North Carolina has increased 5% since 2014. 31% more Unaffiliated voters have cast ballots at Early Voting sites in 2018 (292,246), compared to this point in the 2014 cycle (222,528), which surpasses the 23% growth in registered Unaffiliated voters in that time. With 6 days remaining, twenty-nine of North Carolina’s 100 counties have seen more voters so far than during the entire 2014 Early Voting cycle. Fourteen counties have seen an increase in the number of Black voters. Across the state, Wake, Durham, Mecklenburg, Forsyth, and New Hanover have seen the greatest increase in the number of ballots cast at Early Voting sites compared to 2014. Durham and Robeson have seen the greatest increases in Black voters. Half of North Carolina counties (50) have seen an increase in the number of Early Voters under 26 compared to the 2014 cycle, with the greatest increases in Wake, Mecklenburg, Durham, Watauga, Buncombe, Forsyth, and Jackson Counties– all of which are home to colleges and universities. Challenges remain for voters in some hurricane-impacted counties. Of the 28 counties receiving federal assistance in the aftermath of Hurricane Florence, 23 counties have seen fewer ballots compared to the 2014 cycle, and 26 have seen fewer ballots cast by Black voters. Of the ten counties with the most registered voters, 7 have surpassed 2014 Early Vote totals. Over the summer, Senate Bill 325 put pressure on counties to reduce the number of Early Voting sites and weekend hours during the Early Voting period. The bill also proposed eliminating the popular last Saturday of Early voting, which is disproportionately used by Black voters. After rigorous advocacy by voter advocates, the legislature added the Saturday back for 2018 only–leading to this year’s 18 day cycle–but the majority of North Carolina counties cut the number of sites, availability of weekend Early Voting hours, or both. Many voters this year will have their first chance since the 2011 redistricting process to elect state legislators from constitutional districts; years of litigation over state legislative maps led to a court order mandating new maps to remedy racial gerrymandering. North Carolina voters also have the opportunity this fall to vote on six proposed constitutional amendments. Democracy NC opposes these amendments as broad, misleading, and harmful. Since Early Voting is 18 days long this year, Democracy NC will release in-depth analyses of turnout patterns across the state on Mondays and Thursdays throughout the remainder of the Early Voting Period. These analyses are based on one-stop absentee ballot data available from the North Carolina State Board of Elections and Ethics Enforcement. Download a link to the full analysis.